Yes. It’s another blog about “the economy.” And why not? We talk about it, read about it, obsess about it. It makes us feel good or bad, up or down. It is our barometer – if it’s good for the economy, then it is good. That is why more than 30 years ago, the first (I believe) economic impact study was undertaken to prove that the arts were important to the New York City economy. It was during the city’s fiscal crisis in 1978. Cuts were being made in every city agency including the Department of Cultural Affairs of which I was the Deputy Commissioner. An economic impact study was the brilliant idea of Martin Segal who was at the time Chairman of the Mayor’s Commission on Cultural Affairs. The concern, of course, was that the arts budget would suffer disproportionately. Segal knew how important arts and culture were to the city. Spending of audiences from throughout the world brought millions to the city’s coffers. He wanted power brokers and the public at large to understand that in dollars and cents. Since that time, cities, counties and states have made the effort to tell the story of the arts in economic terms. Here in Westchester when we talk about the arts and the economy, we have a great story to tell. Working with Americans for the Arts, ArtsWestchester has produced successive reports every five years since 1995. 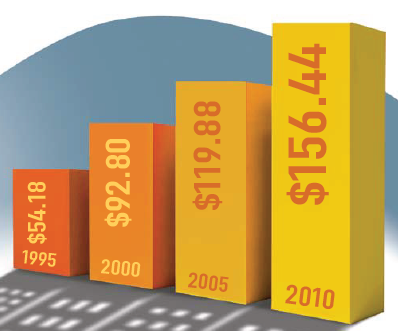 These reports demonstrate that the economic impact has continued to build to $156 million in 2010, with some 4,800 jobs. It is a daunting task reaching out to 150 affiliates, begging data from overworked colleagues, doing live interviews with arts-goers and culling the information. We do this to let the public know that arts organizations are responsible businesses, employers and consumers. Nationally, nonprofit arts organizations generate $135 billion in economic activity annually, supporting 4.1 million jobs and generating $22.3 billion in government revenue. People seem to yawn when we say the arts are good for kids of all ages, good for communities, good for education, good for health. But, tell folks that the arts are good for the economy and they perk up. So, starting a year ahead of time, we interviewed 906 people at arts events and just as we thought, the results show that arts and culture are good for local merchants. The typical attendee in Westchester spends $22.17 per event, on items such as meals, parking and babysitters. Of the people we interviewed, almost a third were tourists. Turns out that tourists spend more than residents, but that’s a good thing. It brings more dollars into our region. And go figure: Arts travelers are ideal tourists—they stay longer and spend more. So all in all, the arts are good for Westchester and, by the way, they are also good for the soul.